Dental erosion is defined as the loss of tooth substance by chemical processes, not involving bacteria.,,,, It can be caused by variety of intrinsic and extrinsic factors.,,,,,,, Intrinsic factors are the result of endogenous acid, generally gastric acids that contact teeth especially in patients suffering from anorexia, bulimia, and gastrointestinal disturbances. Extrinsic factors are related to frequent consumption of acidic foodstuffs or beverages and exposure to acidic contaminants in the working environment. Dietary acids present in low pH soft drinks are presumably the major erosive ingredients., The consumption of citric fruits juices and acidic beverages, especially soft drinks, has been associated with an increase in the prevalence of dental erosion.,, This kind of modern dietary habit has led to potential health problems, later in life, such as accelerated bone loss resulting in generalized osteoporosis, alveolar bone loss, and periodontal involvement. Both children and parents are unaware of the harmful effect of acid-containing beverages on the teeth (Rugg-Gunn et al. 1989). Over the past 2 years, the soft drink industry has seen a value growth of 11%. In total, 1.3 billion people in India drink nearly 5.9 billion liters of soft drinks per year making it one of the highest soft drink-consuming countries in the world. By adding calcium or phosphate-containing salts in the soft drinks they increase the pH of the respective soft drinks, making the solution a basic one. Considering the present knowledge on dental erosion and its increase steadily in the past few decades, preventive agents are needed. Hence, products such as calcium lactate which efficiently reduce the erosive action of drinks should be better incorporated in soft drinks to limit its adverse effects., Thus, the modification of the formula of acid beverages is one of the possible methods of minimizing their erosive effect. Some decrease the mineral loss of enamel and dentine under conditions of erosion. One of such compound used is calcium lactate. Calcium lactate is a tasteless, nontoxic, and fairly soluble compound. Investigation of the effects of calcium concentration, pH values, and taste may facilitate the formulation of an improved soft drink making it with a reduced erosive potential. Hence, the basic purpose of this study was to evaluate if the addition of calcium lactate to soft drinks to know whether there is a decrease in the amount of erosion. Three soft drinks (MaazaCoca-Cola, AppyFizParleAgro, and PepsiPepsiCo) were taken, and normal water was taken as control group. The respective soft drinks with the above-mentioned superscript have been used for the study. Forty dental blocks were taken based on inclusion and exclusion criteria. Inclusion criteria include intact tooth surfaces without any lesions, teeth extracted for orthodontic treatment, and teeth extracted from healthy child and teeth were excluded with signs of trauma, caries, trauma, erosion, restorations, or any malformations. All the teeth were thoroughly cleaned and polished and then stored in distilled water until use. The teeth were sectioned below cement-enamel junction using the double-sided diamond disk in a micromotor handpiece. The tooth specimens were placed in chemically activated chemical acrylic resin. After they were placed in the resin, an 8-mm window was created using tape on two sides in the specimens. Group 4 - ten teeth specimens exposed to Group D containing normal water with and without 5% calcium lactate. Each soft drink was initially checked for their respective pH. The initial pH of each drink was measured using a pH meter (ELINCO PHX-1400 pH METER). Later, the prepared dental blocks were inserted in the respective soft drinks for 15 cycles with 3 s of exposure time for each cycle. 1 min gap was maintained between two consecutive cycles. Surface loss (SL) was assessed using digital surfometry (MitutoyoSurftest SJ-201P) which was present at the Department of Mechanical Engineering, G Mallikarajuna Institute of Technology, Davangere. Sufometry, also known as profilometry, has been extensively used to characterize surface roughness caused by erosion. The data obtained from surfometry was recorded in micrometers (μ). After the first step, all dental blocks were rinsed by distilled water. 5% calcium lactate powder was obtained from NICE Chemicals Pvt limited, Kerala, India. Respective soft drinks containing 5% calcium lactate was prepared using a customized mixer. Again pH of the respective soft drinks was checked. Again the dental blocks were kept in the newly prepared soft drinks solution for 15 consecutive cycles with 3 s of exposure time. Between the cycles, 1 min time gap was again kept. SL was again reassessed using digital surfometry. Temperature was kept constant for the entire procedure constant as the temperature does have a significant effect on the pH of the solution. Data were analyzed using IBM SPSS Statistics for Windows, Version 22.0. (IBM Corp., Armonk, NY, USA). ANOVA was used to assess separately degree of erosion of tooth blocks in all the soft drinks samples with and without 5% calcium lactate. The paired t-test was used to determine the degree of SL within each group before and after adding 5% calcium lactate. P ≤ 0.05 was considered as statistically significant. SL of dental blocks after exposure to each solution was checked. 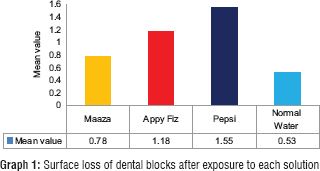 Initially, SL was assessed after the dental blocks were kept in respective soft drinks for consecutive 15 cycles for 3 s exposure with 1 min time gap between the cycles. The highest degree of SL was shown by Group C which contained Pepsi with a mean SL value of 1.55 μ ± 0.07 [Table 1] and [Graph 1]. 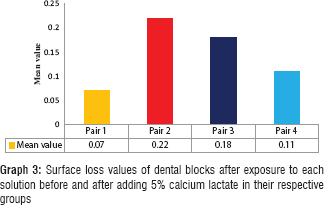 SL of dental blocks after exposure to each solution after adding 5% calcium lactate was evaluated. The highest mean SL was again shown by Group C with a mean value of 1.36 μ ± 0.09 [Table 1] and [Graph 2]. 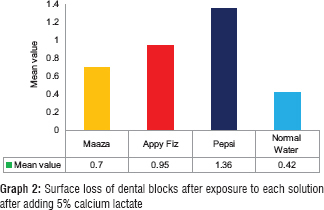 Each dental blocks SL was assessed before and after adding 5% calcium lactate in their respective pairs and the highest mean SL gradation was seen in Group B which had AppyFiz 0.22 μ ± 0.08 [Table 1] and [Graph 3]. This correlates with the previous table that as higher the acidic pH greater the degree of dental erosion. The pH value gradually increased with the addition of 5% calcium lactate. Group C containing Pepsi had the highest acidic pH value of 2.7. By the addition of 5% calcium lactate, there has been a considerable reduction of acidic pH. Group C had the highest rise in pH of 2.32 to show a final pH value of 5.02. After the addition of 5% calcium lactate, the highest acidic pH was shown by Group C which contained AppyFiz with a value of 4.45. Hence with this, it can be said that pH of the soft drinks had a significant change by the addition of 5% calcium lactate [Table 2]. The main aim of this study was to determine the degree of erosion by low pH soft drinks and water before and after adding 5% calcium lactate to it, respectively. The study employed in situ methodology developed to study dental erosion by extrinsic agents. A study by Dr. Beiraghi et al. on erosion which was conducted on rat molars demonstrated that by the addition of 5% calcium lactate to Coca-Cola, significantly reduced erosion in rat molars. Whether this inhibiting action of calcium lactate is due to the calcium ion or lactate, or both, is not clear since no attempt has been made to determine the mechanism of action in this study. However, it seems likely that the effect was due mainly to the reduction of enamel dissolution by calcium ion. In the present study, pH of soft drinks and normal water was checked both before and after adding 5% calcium lactate. It showed that Pepsi had the highest acidic pH of 2.7 followed by AppyFiz (3.2) before the addition of 5% calcium lactate. After the addition of 5% calcium lactate, pH of all the soft drinks had significant changes. pH of Pepsi got increased to 5.02 whereas of AppyFiz to 4.45. Similar study results were obtained by the study conducted by Awasthi et al. The study demonstrated the erosive potential of five commercially available flavored drinks in India. The drinks used were Pepsi, Apple juice, AppyFiz, Gatorade (sports drink), and flavored milk. In the in vitro study by Mita et al., adding 1.5%–2.0% POs-Ca slightly increased the initial pH of apple juice to reach approximately 3.8, and the enamel erosion caused by the juice could be decreased. This study showed similar positive results to that of the current study stating that lower pH of the drinks higher the erosive power of the drinks, and adding basic adjuncts to the respective solution considerably reduced the acidic pH as in turn reduced the erosion of the tooth surface. Although the erosion and caries processes are different in their histological appearance, the two conditions occurring concurrently could be deleterious to dental hard tissues. It is necessary to educate patients about the harmful effects of excessive consumption of soft drinks and should advise them. Over the past 2 years, the soft drink industry has seen a value growth of 11%. In total, 1.3 billion people in India drink nearly 5.9 billion liters of soft drinks per year making it one of the highest soft drink-consuming countries in the world. Hence, products such as calcium lactate which efficiently reduce the erosive action of drinks should be incorporated in soft drinks to limit its adverse effects. Follow the manufacturer's instructions on usage and dilution, ideally serve soft drinks only during mealtimes, keep drinking times very short and use a straw whenever possible. Cooled soft drinks have less erosive potential. Hence, consume soft drinks when it is cold. Drinks should not be swished around the mouth or held in contact with tooth surfaces for a longer period. Avoid toothbrushing immediately following consumption of an acidic drink. After meals consume something to neutralize the acid present in soft drinks, e.g., cheese or milk. Low erosive beverages may be a valuable alternative to other acidic soft drinks. Mita H, Kitasako Y, Takagaki T, Sadr A, Tagami J. Development and evaluation of a low-erosive apple juice drink with phosphoryl-oligosaccharides of calcium. Dent Mater J 2013;32:212-8. Awasthi N, Singh S, Grover N, Kaur M. Erosive potential of five commercially available flavoured drinks in India. Int J Oral Health Dent 2015;1:168-71. Beiraghi S, Atkins S, Rosen S, Wilson S, Odom J, Beck M, et al. Effect of calcium lactate in erosion and S. mutans in rats when added to Coca-Cola. Pediatr Dent 1989;11:312-5. Tahmassebi JF, Duggal MS, Malik-Kotru G, Curzon ME. Soft drinks and dental health: A review of the current literature. J Dent 2006;34:2-11.
ten Cate JM, Imfeld T. Dental erosion, summary. Eur J Oral Sci 1996;104:241-4. Lussi A, editor. Monographs in Oral Science. Dental Erosion: From Diagnosis to Therapy. University of Bern, Switzerland: Karger; 2006. Jensdottir T, Bardow A, Holbrook P. Properties and modification of soft drinks in relation to their erosive potential in vitro. J Dent 2005;33:569-75. Hughes JA, West NX, Parker DM, van den Braak MH, Addy M. Effects of pH and concentration of citric, malic and lactic acids on enamel, in vitro. J Dent 2000;28:147-52.